Report of case: A 41 year old woman was referred by a gastroenterologist for chronic abdominal pain of six months’ duration. She described pain that occurred frequently throughout the day, ypically lasting between 30 minutes and two hours. The pain was mainly epigastric but had a colicky right upper quadrant component also. She described severe postprandial attacks that had limited her alimentation to mainly liquids over the previous two months. She had an involuntary weight loss of 8 to 10 pounds over the six month period. An extensive workup including upper and lower endoscopic examinations, a barium swallow with small bowel follow through and a CT scan of the abdomen and pelvis had been done. Salient findings included situs inversus abdominis. The spleen and stomach were on the right, the proximal jejunum and majority of the small intestine were located on the left, while the entire colon was in the right abdomen. The gallbladder was centrally located between two large hepatic lobes. Base on the patient’s symptoms, an abdominal ultrasound and radionuclide hepatobiliary scan were completed. The ultrasound was normal. The radionuclide scan featured normal gallbladder filling and an ejection fraction of 19.8%. A diagnosis of biliary dyskinesia was made. Technique: The patient was placed in the low lithotomy position with the surgeon positioned between the patient’s legs. Abdominal access was gained with a non-bladed 11mm trocar just superior to the umbilicus. A 30 degree 10 mm laparoscope was used. Additional trocars were placed under direct visualization and included a 5 mm trocar in the right upper abdominal quadrant and two 5 mm trocars in the left upper abdominal quadrant. Anatomical variations included the portal vein crossing anterior to the common hepatic duct and the presence of a very short cystic duct. The dome-down approach was very useful and allowed excellent exposure of critical structures. The cystic duct was isolated, clipped and divided. The gallbladder was removed and the the trocar sites closed. Results: The patient had an uneventful postoperative recovery and was discharged home the same day. She was seen in the office a week later and was doing well. She remains asymptomatic 8 months after surgery. Discussion. Gallbladder disease in patients with situs inversus abdominis presents a unique set of challenges centering on significant anatomical abnormalities. 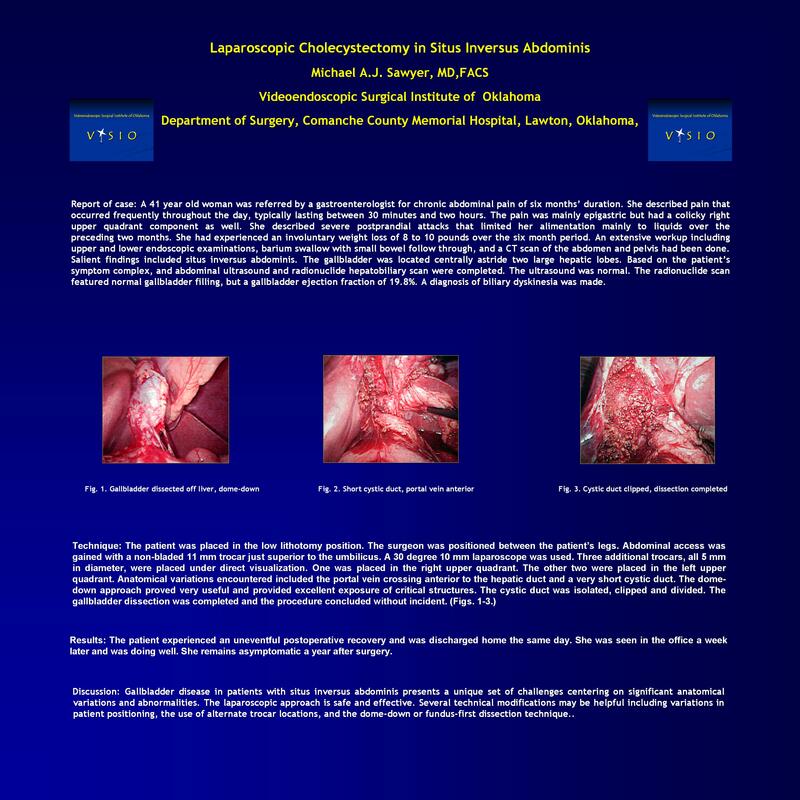 The laparoscopic approach is safe and effective. Several modifications may be helpful including variations in patient postitoning, the use of alternate trocar locations and the dome-down dissection technique.